Regardless of the jokes and debates (e.g., is it really “functional”) about the bench press, it’s a great exercise. The standing barbell press is too, but we’ll get to that later. Before we get to the how-to videos, let’s discuss the pros and cons of the barbell bench press. The bench press primarily engages the chest, anterior shoulders, and triceps. Put another way: it uses a lot of muscle mass in the upper body, and that’s why it’s such an effective, efficient exercise. One of the main benefits of the bench press is its loading potential. The barbell allows you to control the amount of weight put on the bar. This is especially true if you use fractional plates; you can add a mere half-pound to the bar. The ability to load the bar with small increases allows for longer progress to be made for the exercise. For example: if I told you to add 5 pounds to the bar every time you bench pressed (the typical smallest weight increase from putting a 2.5-pound plate on each side of the bar) you’d likely stall out quickly. But if you added 2 pounds, or even 1 pound as the weight got heavier, you could make progress much longer. If you want to get strong and want to do so efficiently, the bench press is a great exercise for training a horizontal pushing movement. The main shortcoming is apparent for some women, particularly very petite women: a standard 45-pound barbell (the only option at many gyms) can be too heavy when starting out. If you’re lucky enough to train at a facility that has 35-pound bars, then you shouldn’t have a problem getting started. If your gym only has 45-pound bars, and it’s too heavy at first, you’ll have to build up some strength before performing the bench press. I’ll provide my favorite exercise for this in a moment. Another shortcoming of the bench press: it can cause shoulder discomfort or pain for some trainees depending on injury history, anthropometry, etc. Now, some people experience shoulder pain when bench pressing because they’re using incorrect form, which is addressed in the video below. But for some trainees, even if they use correct form, they can’t perform the movement without discomfort. The exercise I prefer to use for someone who experiences shoulder discomfort from barbell bench pressing and for the trainee who can’t (yet!) use a 45-pound bar is the good ole fashioned push-up. In many ways, I think the push-up is a better exercise than the bench press, mostly because it’s more efficient. With a push-up you’re not only training your chest, shoulders, and triceps like you do with the bench press, but you also use your stomach, low back, and glutes to stabilize your body. If traditional push-ups are too challenging, I suggest performing elevated push-ups as explained and demonstrated in the women’s beginner strength training guide. Watch the video below to learn how to bench press safely. It’s a bit more complex than just pressing the bar up and down. You need to set your feet, grip, shoulder blades, arch, and position your wrists correctly. It’s all explained in the video, and heed the safety warnings so you can train hard, and smart. If you can’t perform the bench press due to lack of equipment, discomfort, or you’re just not confident having a bar hover over your face, I recommend the push-up as an alternative. The dumbbell bench press is great too and is usually better for someone who experiences shoulder pain with a barbell bench press. You can adjust your hand position with dumbbells and the free movement that occurs in the wrist and elbows when using dumbbells – something you can’t do with a barbell – makes the movement better for some trainees. The parallel bar dip is an option too. While the standing barbell press (or simply as it’s been known for decades: the press) is well known and is as old as the invention of the barbell itself, I think it’s greatly underappreciated for how awesome it truly is. Most people think of it as just another shoulder exercise, and that’s not doing this tremendous lift justice. Other than the barbell squat and deadlift, few exercises do such a tremendous job of training the entire body while building strength (from pressing the weight overhead), balance (from pressing a weight overhead and not falling over), coordination, and stability (you need to brace your entire body and keep it stable to get the greatest benefit from this movement). And, frankly, it’s as functional as exercise can get. You pick things up and put them on a shelf, for example. 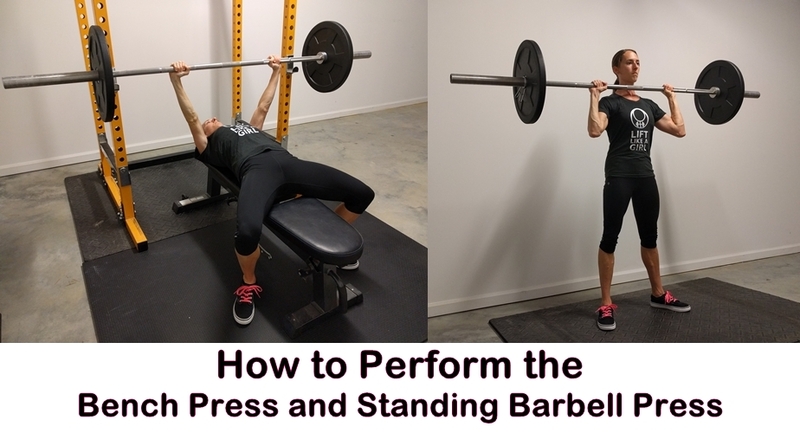 The one glaring, potential drawback to the barbell press is that some women (again, petite women in particular) may have a hard time pressing a standard 45-pound barbell from day one. If the bar is too heavy at first and your gym doesn’t have lighter barbells, I suggest starting with a standing dumbbell press. Keep the reps in the 5-8 range and add weight when possible. Once you can perform several sets (about 3-4) of 5-8 reps with 20 or 25-pound dumbbells, you’ll be able to confidently handle a 45-pound barbell. Once you can press a 45-pound barbell, its advantages compared to the dumbbell variation shine. For one, it’s much easier to control the loading, as long as you use fractional plates. Most standard dumbbells increase in 5-pound increments (unless you have adjustable dumbbells in your home gym, like I do – then you can increase the weight 2.5 pounds) and that can be a huge jump. Think about it: going from 20 to 25-pound dumbbells is a 25% weight increase. And that’s not distributed over both limbs like it would be with a barbell, which is easier because there’s less stability required when using a barbell (since both hands are holding on to the same object). With the barbell press you have the luxury of taking the bar out of a rack, as demonstrated in the video below. But with a dumbbell press, you have to swing it into pressing position. If that still doesn’t make it possible to press a barbell overhead pain free, stick with the dumbbell press variation. Specifically, use a neutral grip – palms face each other – when you press overhead. Be sure to include that extra “shrug” at the top too. If you’re one of the individuals who can’t press overhead, or has been instructed not to from a therapist or doctor, don’t get discouraged. Just stick to horizontal pressing (e.g., push-ups, bench press variations, etc.) and supplement your shoulder work with some dumbbell or resistance band lateral raises. You may be wondering: If I think the push-up is in ways better than a bench press, why don’t I recommend handstand push-ups instead of a barbell press? I like handstand push-up variations, and they are an option. However, the barbell press delivers greater training economy because it’s performed standing up, so there’s a greater balance and stabilization component from having to use your stomach, glutes, and legs to stabilize. Plus, you can train it through a longer range of motion; with a handstand push-up you stop once your head touches the ground (unless you elevate your hands, but this is very difficult). The handstand push-up is also more difficult to progress than a standing barbell press. Refer to 7 of the Best Bodyweight Exercises You Should be Doing for more information about bodyweight exercises. The bench press and standing press are excellent exercises for building upper body pressing strength efficiently. That’s why they’re awesome, and why women should include them in their strength training program. Never underestimate the power of getting strong with big basic exercises. Like what you read? Never miss a thing. Sign up below to receive the newsletter. You’ll also get the Beautiful Badass Mini Course as a free gift.